Beaches along the sides of rivers are formed by deposition of sand by the river during periods of high discharge. Discharge is amount of water flowing through a river a given point of time. 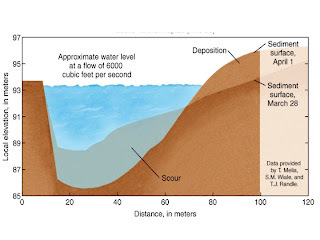 Discharge is measured in cubic feet per second or "cfs" and is calculated by multiplying the width(in ft) x depth (in ft) x velocity (in ft/sec) . Discharge of a river increases during periods of snow melt and periods of heavy or prolonged rainfall. During periods of high discharge the height of the river increases. If the river is in a deep canyon like the Green River in the canyon of the Lodore, it doesn’t tend to get much wider. It just gets deeper and flows faster. This faster flow allows the river to scour (pick up) the sediment from the bottom. Also, when the river is flowing faster it can pick up and transport larger sediment like sand. As the discharge decreases, the velocity will decrease too. This will cause the river to drop its sediment load – the larger and heavier particles first (like sand) on the sides of the stream forming what river-runners call a beach. The diagram below shows how beaches were built from an artificial flood in the Grand Canyon in 1996. The diagram shows the river before the flood (March 28) and after the flood (April 1). Notice that after the flood the channel is deeper because the faster moving water scoured the sediment away. This scoured sediment is then left on the side of the river in the area labels deposition – VOILA! A beach…like the one you see in the picture below. Riverine beaches will erode over time and the sand will end back in the river channel. New floods (periods of high discharge) will scour the channel again and re-deposit sand on the sides. The discharge level of the Green River was unusually high this year. There was a lot of precipitation this year. The snow that fell even late this season was melting making the river’s discharge extra high. This high discharge may be restoring some beaches. We'll have to see after the discharge decreases later in the season. I think that beaches are a cool way to see what the river really did. It’s cool that the river is able to pick up and carry that much sediment. I also think it is cool that in a number of years down the line, that the beach you stand on one day could be gone. A new beach might take its place, but it would be all new sediment. 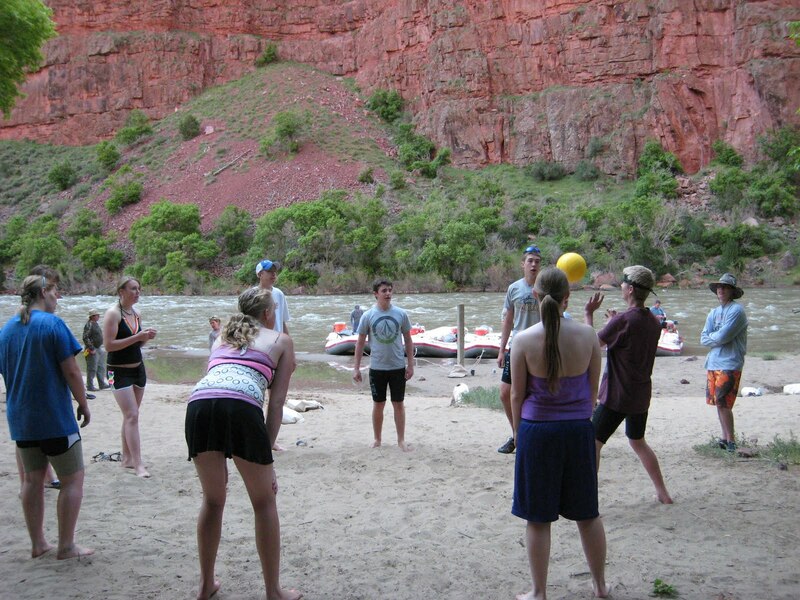 On our first night of our river trip we stayed on a beach. It was fun to walk around with no shoes on because you don’t have to worry about stickers or pointy objects cutting your feet. You could lie down and feel the warmth of the sediment. We also could dig down and bury each other in the warm sand. And that is why I like beaches. Nice job Tanner. But I was hoping for your picture in this too! Beaches are great places to bury poor freshmen and sculpt them into something new.